Dubai Lifestyle App is one of the longest running scam trading systems. 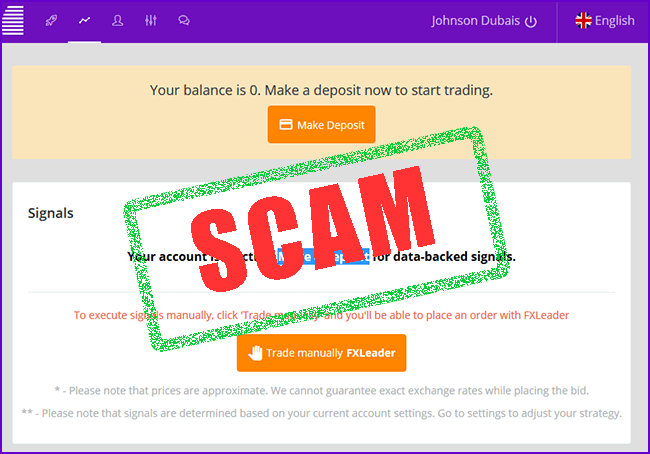 They initially released the software in July of 2016 for binary options, and it is amazing that suckers are still falling for the scam. There are quite a few problems we found when we reviewed Dubai Lifestyle App, and we urge you to read the entire review, before you lose your money. If you already lost your money at Dubai Lifestyle, you can learn why here. Smart people use a real trading software like one of these. Across the top of their website they write, “Be One Of 100 BETA TESTERS To Profit From The DUBAI LIFESTYLE APP”. The truth is that they are not looking for beta testers, they are looking for people to deposit there money at a binary options broker. They try so hard to get us to deposit money, that the minute we tried to close their website it said: “Do you really want to miss out on profiting over $7,183.80 per day?”. Hate to be the source of bad news, but there is no automated trading robot in the history of binary options that has ever turned $250 into $7,183 a day. You should take a minute to read about a real trading robot, so that you can properly compare it to a fake one, see here. Now that you know what a real auto trading robot looks like, you will understand that the Dubai Lifestyle software is nothing more than a gimmick. When we logged into the website at http://dubailifestyleapp.com/en/, there are no settings, or ability to even turn the robot on/off. This is very dangerous because either you are not getting any software, or the software is not in your control, and only the scam broker can control it. Each day 1000’s of people visit ScamBroker.com looking to see how they can get their money back from a scam broker. Sadly, most of these people will never see their money again. When we joined the Dubai Lifestyle App from Canada, they asked us to deposit money at a place called FXLeader. This broker is not licensed or regulated, by anyone, anywhere. Go read: Why investors only use a licensed broker. If you want to trade Forex or Currency seriously, then you should choose a broker from the Top Rated Brokers page. Tell other readers how you lost money with Dubai Lifestyle in the comments section below.